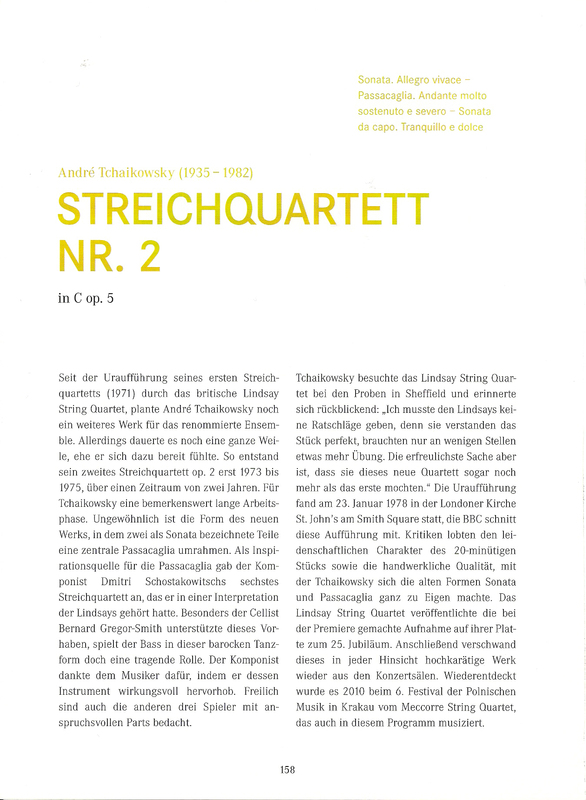 This webpage provides information about the André Tchaikowsky String Quartet No. 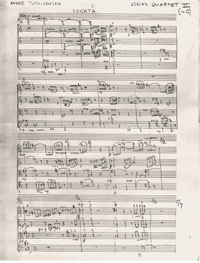 2 in C (1973-1975) - Opus 5. 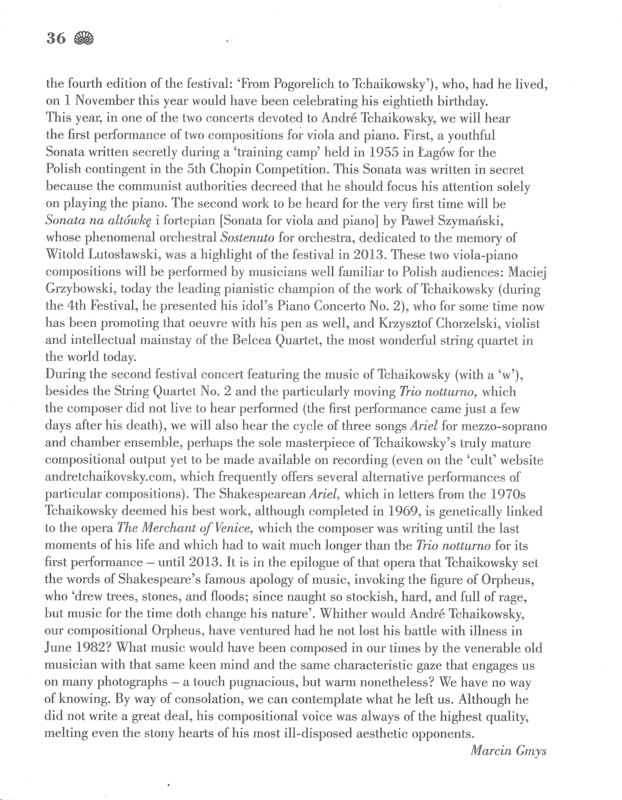 This includes music links and then text that lists all known details regarding this composition from the book, The Other Tchaikowsky - A Biographical Sketch of André Tchaikowsky. 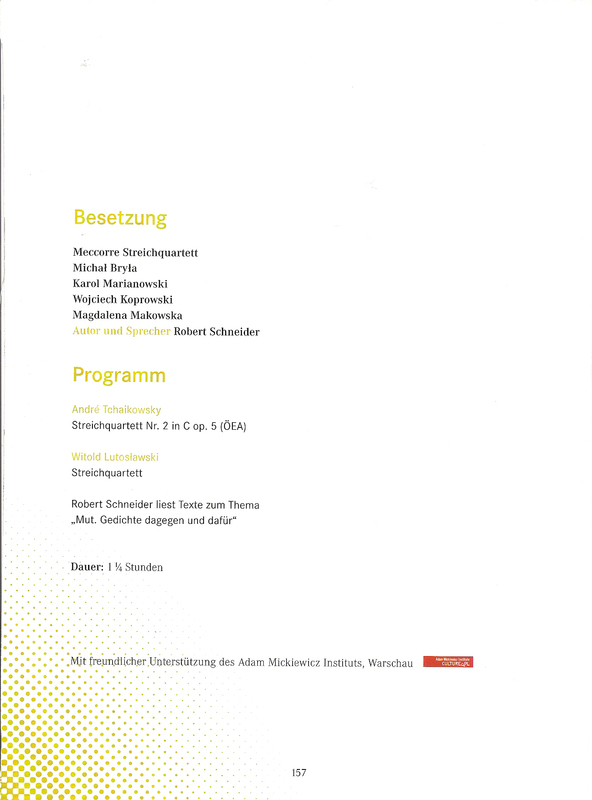 See the images below for scenes from the concert and pages from the program. 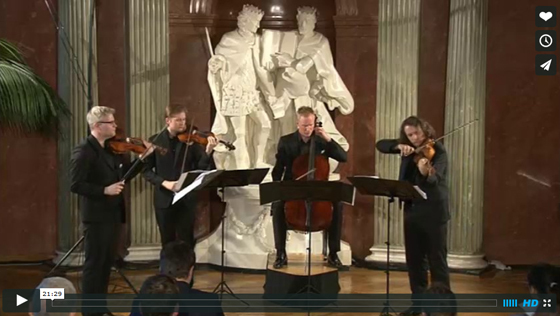 Almost immediately after this performance, the Meccorre String Quartet headed to Belfast, N. Ireland for a repeat performance and other works. Click Here for more information regarding the Belfast concerts. 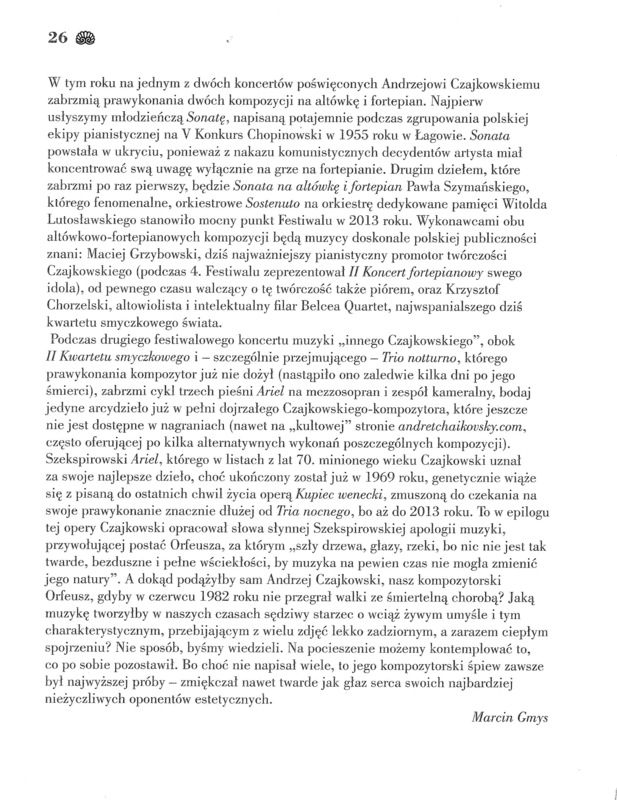 Click Here for a news article (in English). 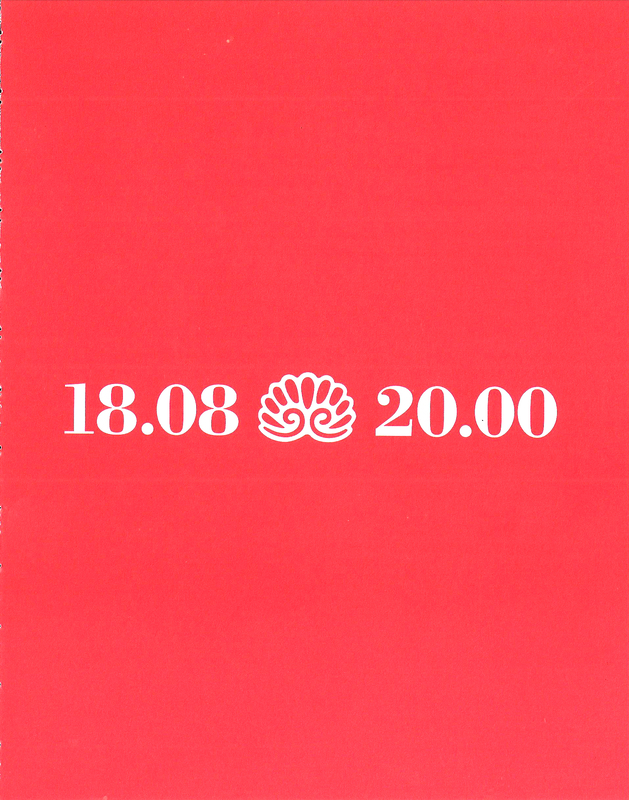 Shortly after this concert, the Meccorre played the 2nd String Quartet again at St. Conals Church in Donegal, Ireland at part of the Casimir Concerts season. 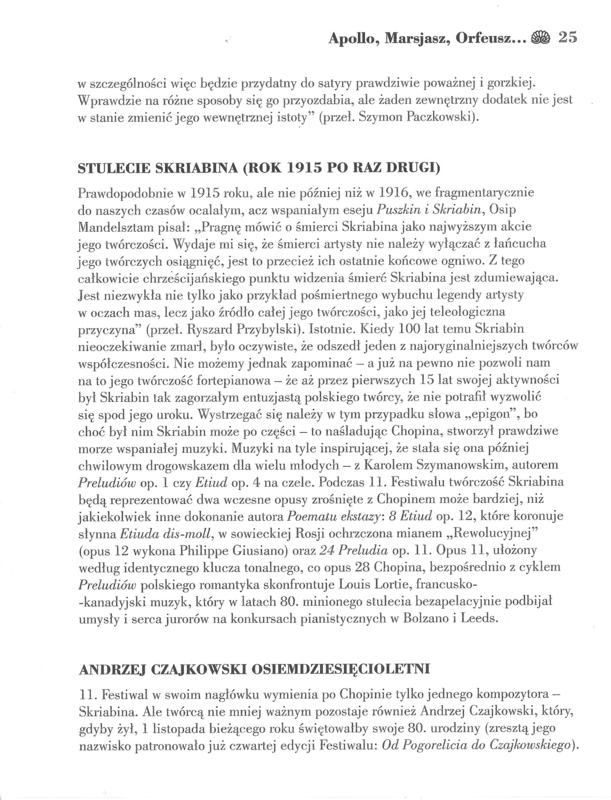 Click Here for additional information and Click Here for the PDF program (page 12). 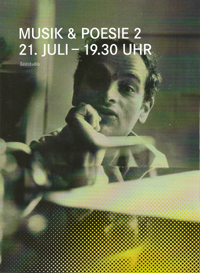 This live performance is now on Vimeo (Click Here). 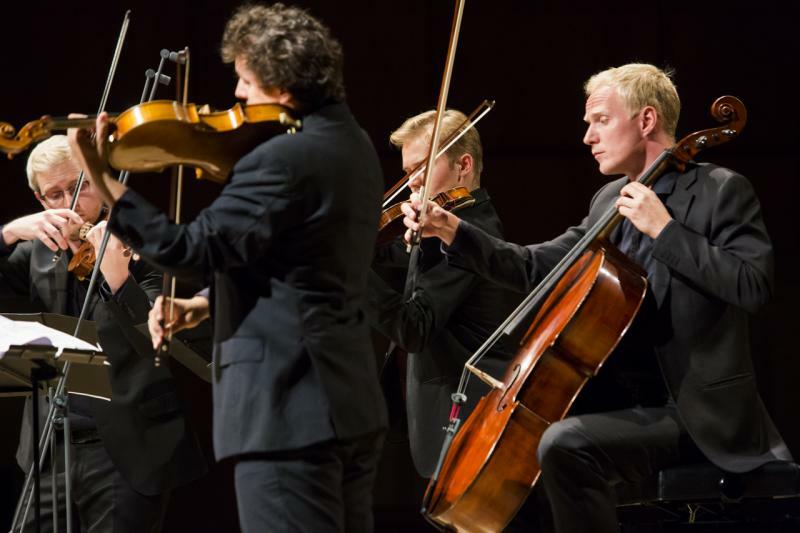 The 2nd of the "Music and Poetry" concerts for the 2013 Bregenz Festival featured the Meccorre String Quartet (website). 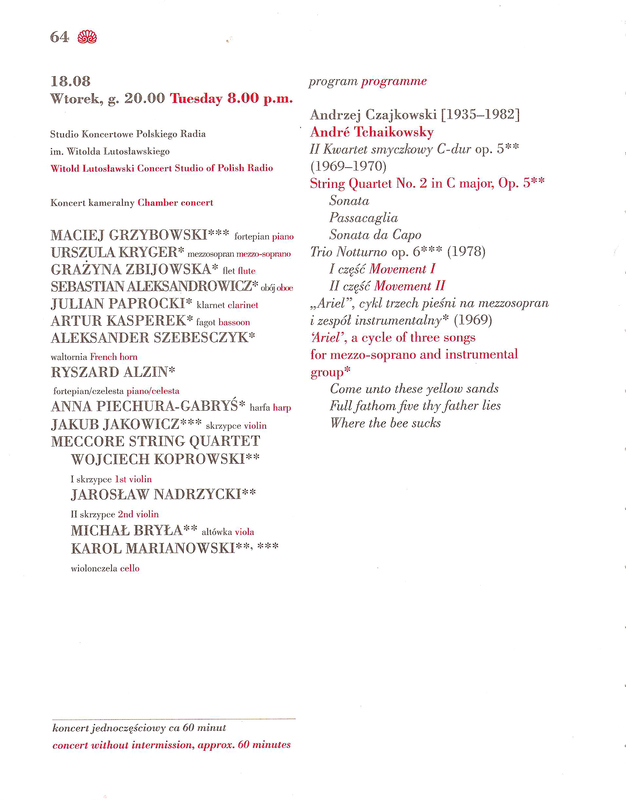 Their program included the playing of André's 2nd String Quartet. 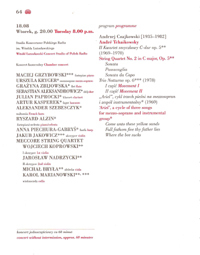 Members for this concert were Michal Bryla viola, Karol Marianowski cello, Wojciech Koprowski violin, and Magdalena Makowska violin. 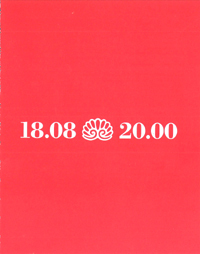 The 2004 performace is by the Camerata Quartet (Kwartet Camerata in Polish). 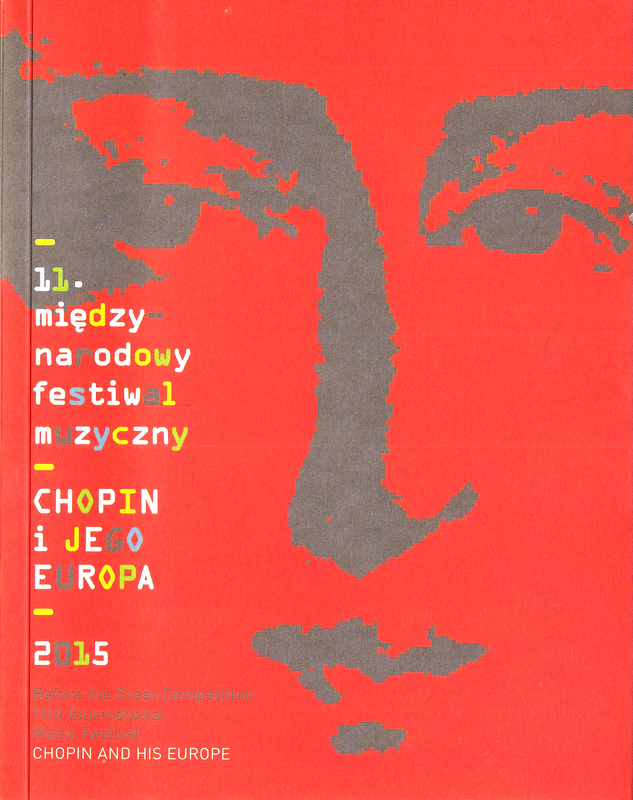 The occasion was the 7th Polish Radio Music Festival and the performance was in the Polish Radio Szymanowski Hall. 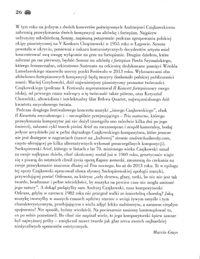 Click Here for their website in English, or Click Here for their website in Polish. The following performance is the world premiere recording from January 23, 1978, which also appears on a Lindsay Quartet CD to celebrated their 25th anniversary. This CD is on the Academy Sound and Visions (ASV) label, CD #DCA 825. 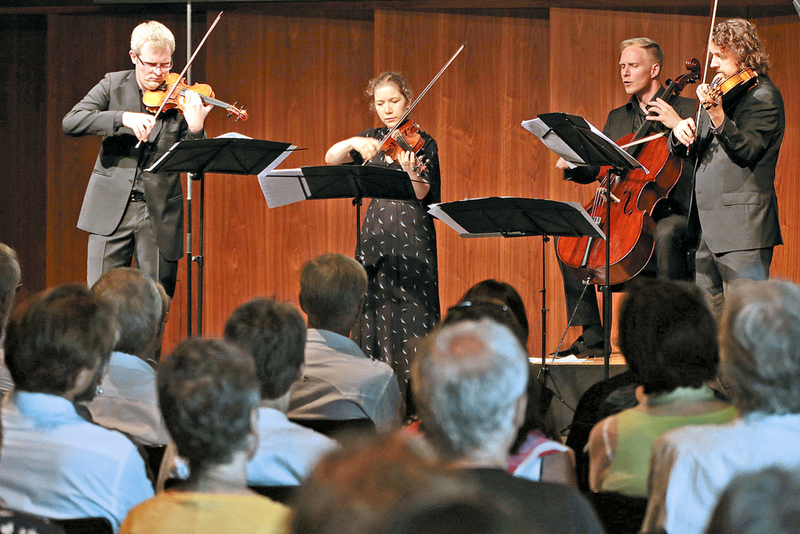 To celebrate their 25th anniversary, in a typically imaginative gesture, the Lindsay String Quartet has brought out a CD of four 20th-century works, all live performances. 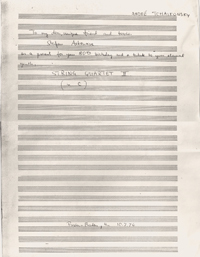 The works by André Tchaikowsky and Hugh Wood (both written for the Lindsays and here in world premiere recordings) are less of an easy listen. 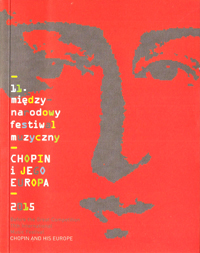 The Polish-born pianist and composer André Tchaikowsky left only seven compositions when he died tragically in 1982 at the age of 46. The elegiac Passacaglia of this quartet brings full-blooded, passionate playing, a Lindsay characteristic, while Hugh Woods third quartet, a gritty, complex single movement brings out the Lindsays remarkable range of instrumental colour, intensity of feeling and vigorous attack. A highly welcome anniversary disc. 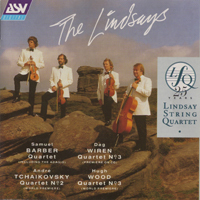 The disc reveals the wide musical interests of the Lindsay Quartet. 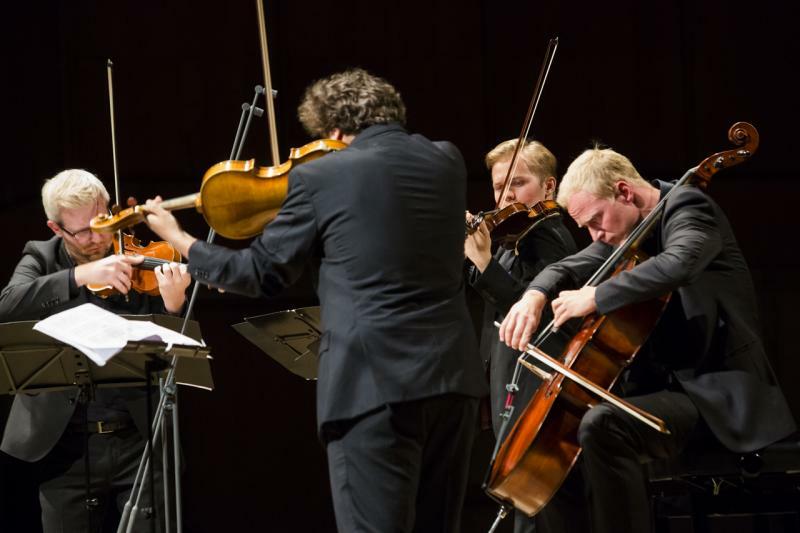 While their cycles of the quartets of Beethoven, Bartok and Tippett are well-known, here  with the exception of the Adagio from Barber's Second Quartet  they are playing music which is little-known but in which they firmly believe. Andre Tchaikowsky's Second Quartet was recorded in 1978 when the composer was still alive. 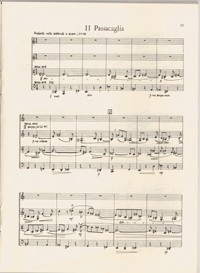 Although better known as a fine concert-pianist, his small output of compositions (there is, I know, a particularly striking Piano Concerto) has attracted considerable critical attention. 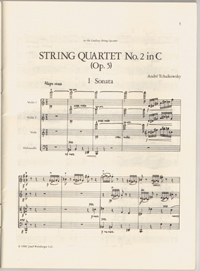 His Second Quartet is a passionate and lyrical work in three movements which are played without a break. 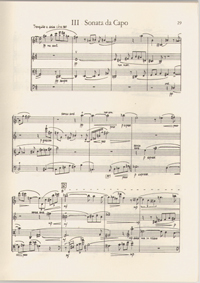 The central Passacaglia is a wonderfully haunting movement which reminds us not only of the composer's Polish background but of his love for the music of Beethoven and Bartok. A performance of the 2nd quartet took place on November 6, 2010 as part of the 6th Krakow Festival of Polish Music by the Meccore String Quartet. 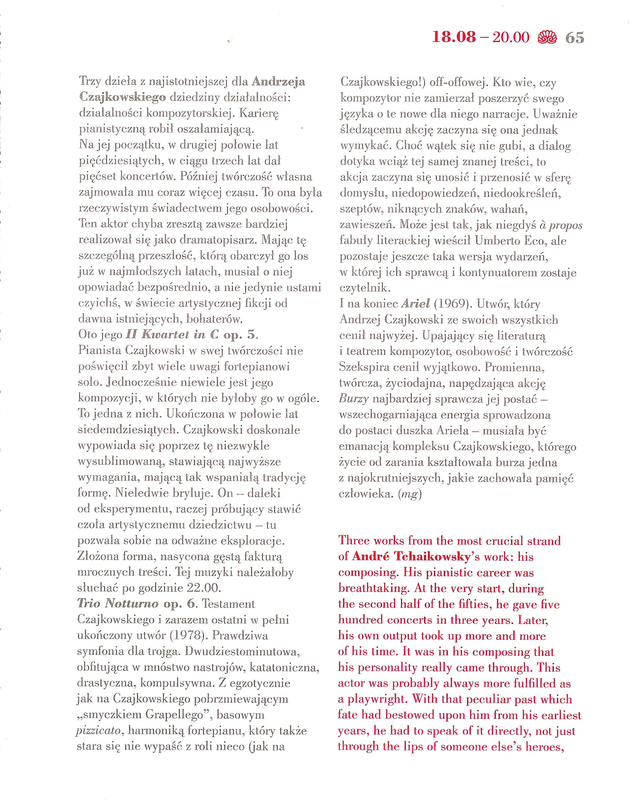 Andrzej Czajkowski music was his fate - full of pain and loneliness. 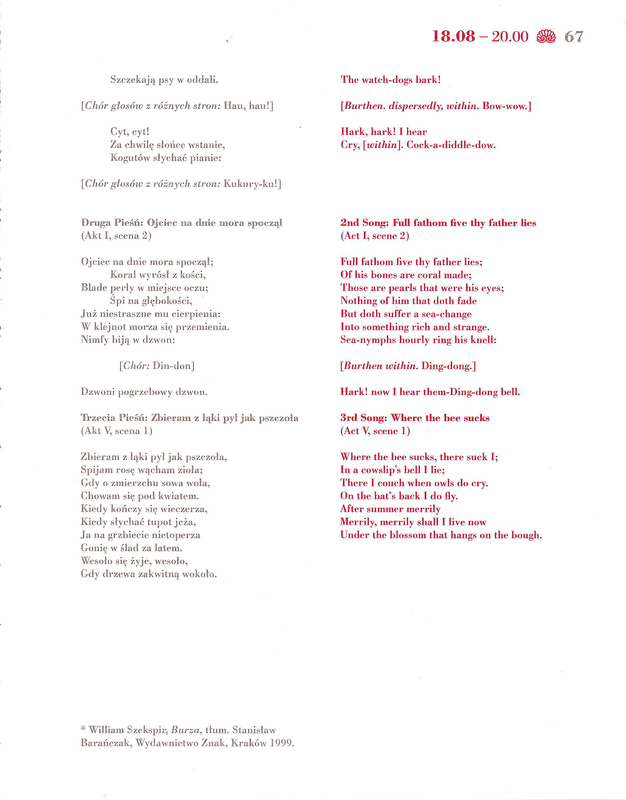 It is also music very well thoughtout and composed with mathematical precision. 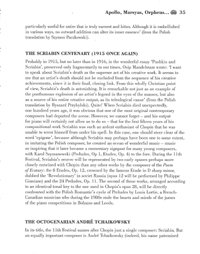 Polyphony is a dominant texture of this music of pain and loneliness, which could tear apart the soul of the listener, plus it put enormous technical requirements on the performers. 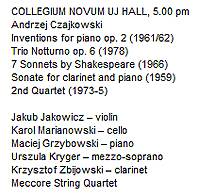 Yesterdays monographic concert at the Jagiellonian Universitys Collegium Novum brought a level of performance equal to the level of Andrzej Czajkowski's composing skills - Masterful. 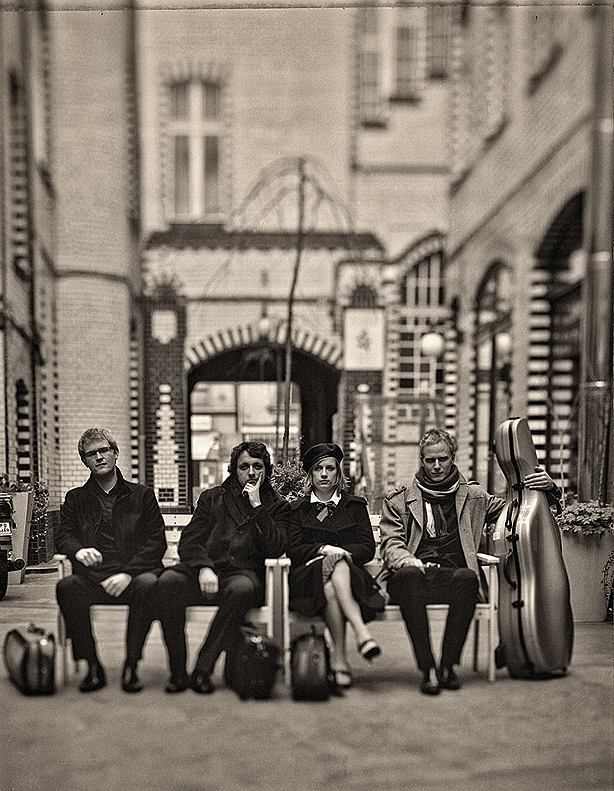 These wonderful artists of the younger generation - Meccore String Quartet - composed of Wojciech Koprowski (violin), Aleksandra Tomasinska (violin), Michal Bryla (viola), and Karol Marianowski (cello) played the Second Quartet String cleanly with precision and with perfect synchronization, all within a mutual sense of spontaneity. A performance of the 2nd quartet took place on July 21, 2013 as part of the 2013 Bregenz Festival Events featuring the compositions of André Tchaikowsky. 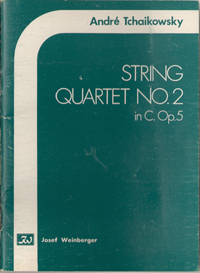 The quartet was once again the Meccore String Quartet, as noted above. 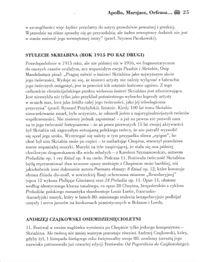 This work is published by Josef Weinberger and appears in their catalog of André Tchaikowsky published works. 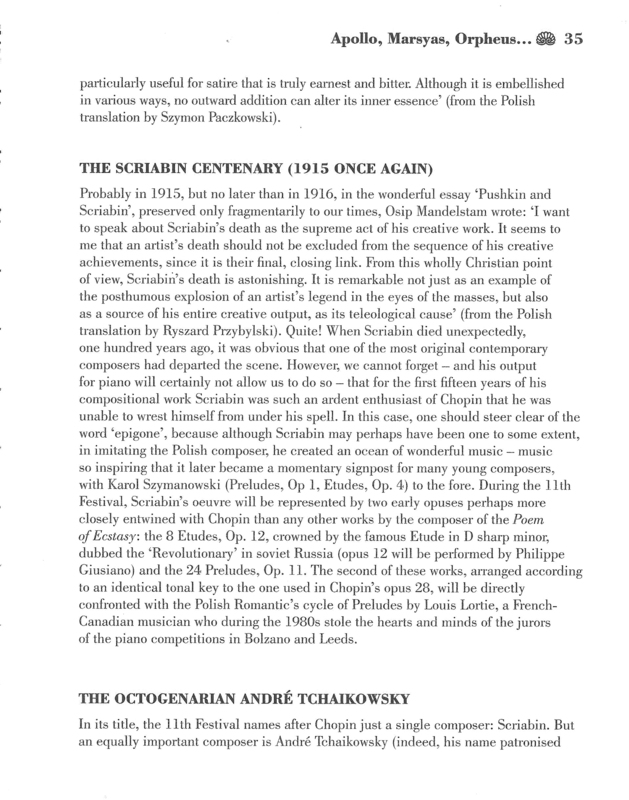 Click Here for a PDF copy of the André Tchaikowsky Weinberger catalog. 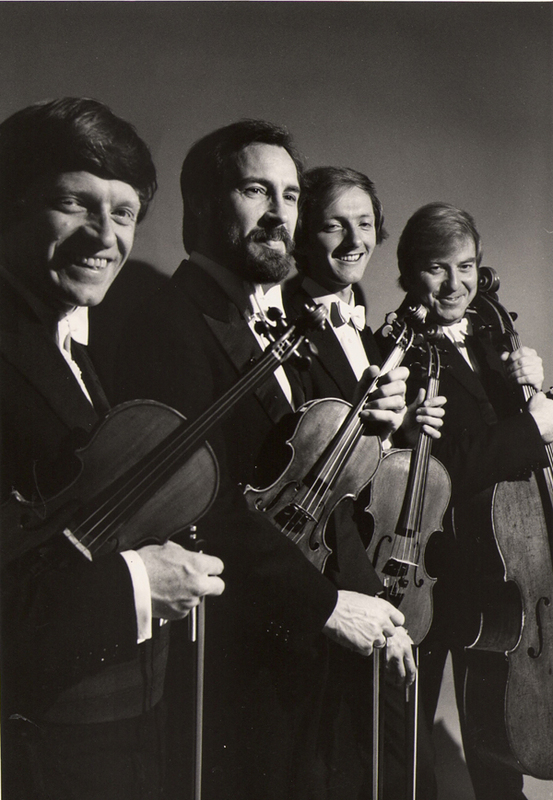 In July 1971, the Lindsay Quartet gave the first performance of my first quartet and immediately suggested I write another. I was flattered by the request and eager to show my gratitude. But I could think of nothing more to say in the medium and was afraid of repeating myself, so I merely promised to think about it. Some months later, I heard the Lindsay Quartet play the Shostakovich sixth quartet. 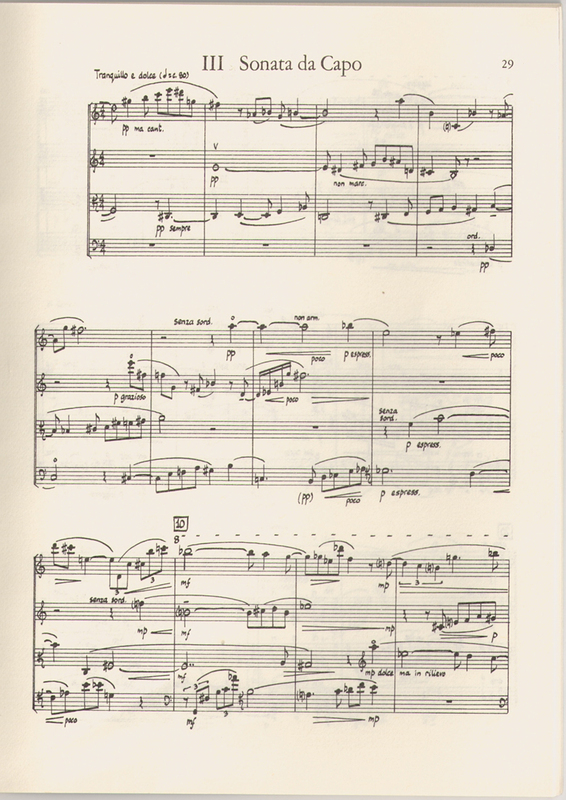 The slow movement of that work is a simple and beautiful passacaglia, a form I should never have dared to attempt in a string quartet for fear of boring the ·cellist. 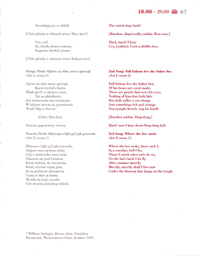 Bernard Gregor-Smith suggested a passacaglia with a varied bass, and this immediately helped to focus my ideas. 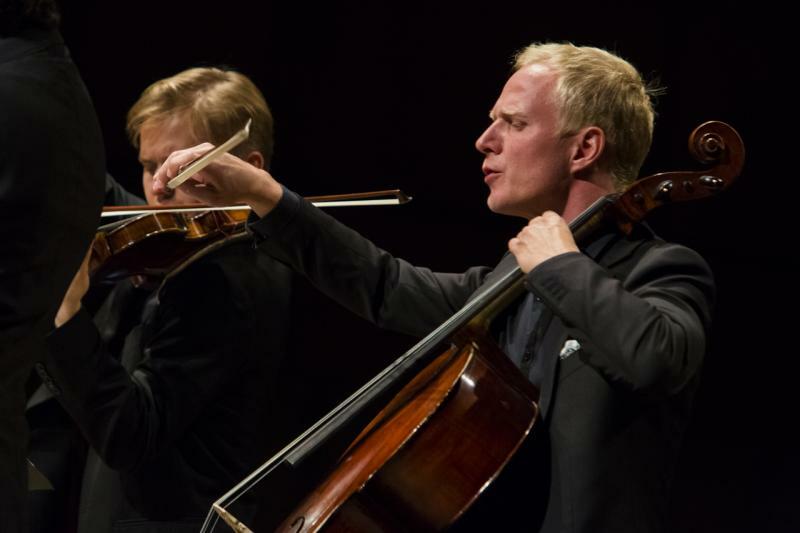 Even then, the cellist was still restricted to going 'round in circles,' so I decided to compensate in the outer movements by giving him conspicuous and flamboyant solos. 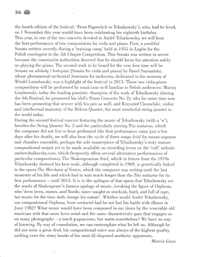 The next logical step was to extend the concertante treatment to the other players. 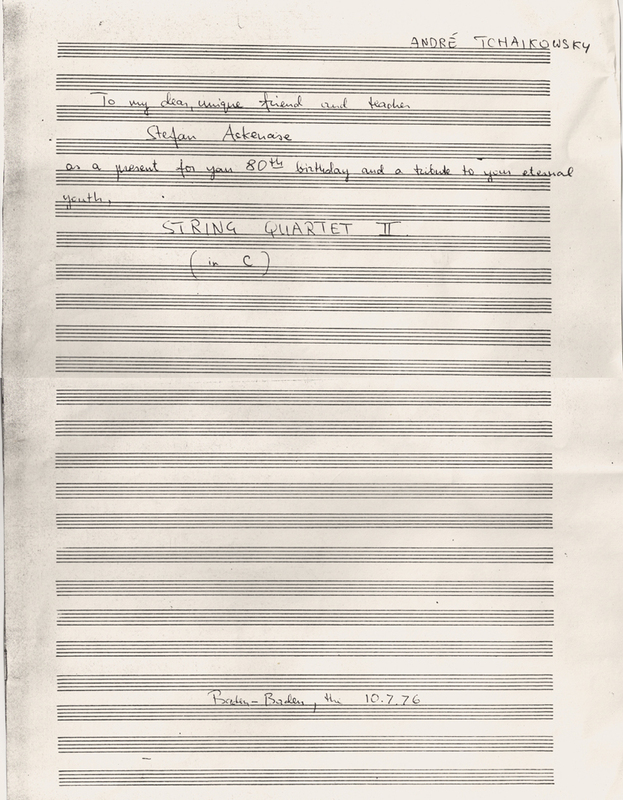 This at once allayed my fears of producing an identical twin of my first quartet, in which my chief aim had been a close knit truly chamber texture, and I now relished all the display I had denied myself before: high positions, single and double harmonics, quick alternations or arcato and pizzicato, and so on. It was quite a surprise that, with all of this, the new quartet is easier than the first. Dynamically, the work is shaped like a 'V.' 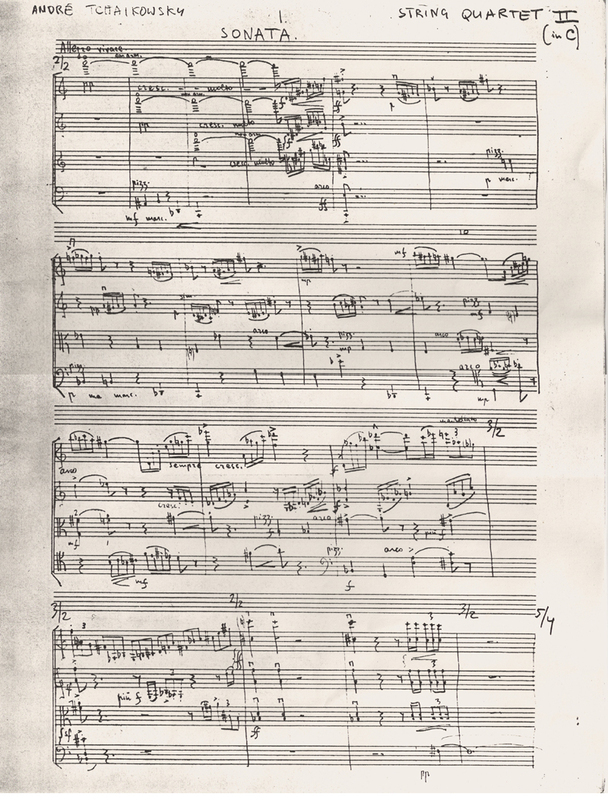 The first movement is a rapid, tense sonata, which calms down towards the end to set the mood for the somber passacaglia. 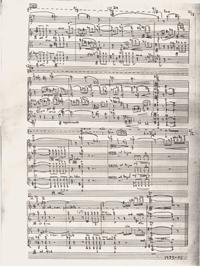 The last movement is a continuous accelerando. As its speed increases, so does the resemblance to the first movement from which it is derived. 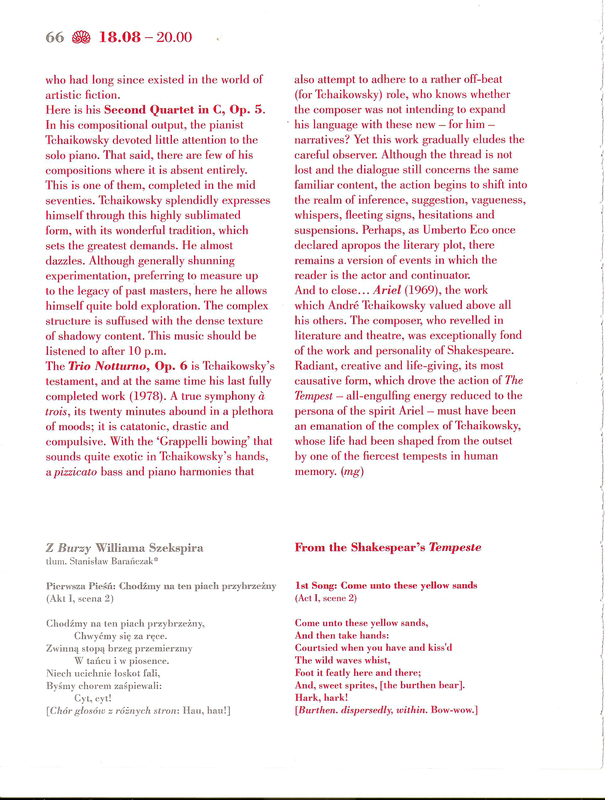 "I didn't need to give the Lindsay any advice, as they understood the piece perfectly well and only needed a bit more practice in a few small places. 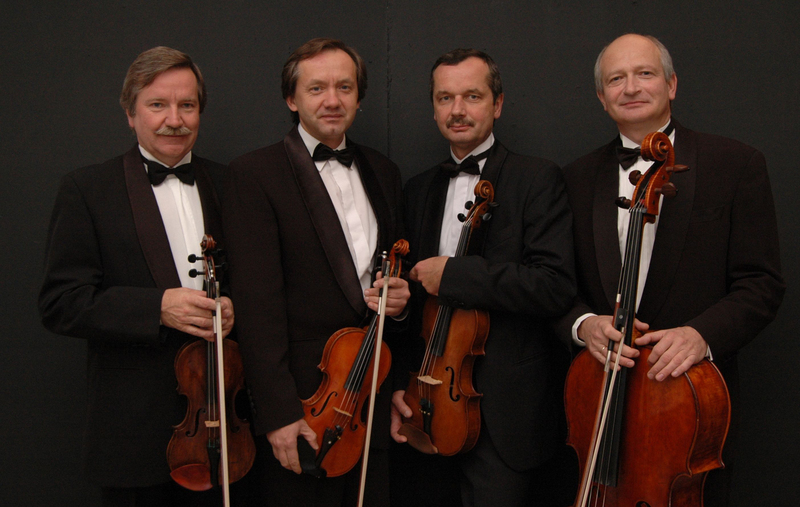 The most pleasant thing is they like this new quartet even more than the first one, although they liked that one too. I'm curious to know the general reaction, although I'm not going to break down if nobody goes along with the performers' opinion." 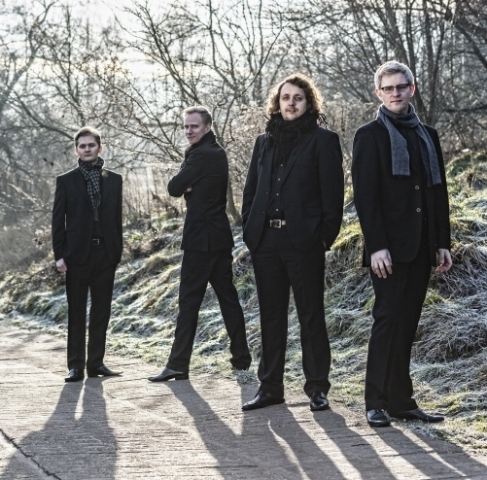 The Tchaikowsky quartet is a work of intense passions forced into a symmetrical argument around a passacaglia slow movement. 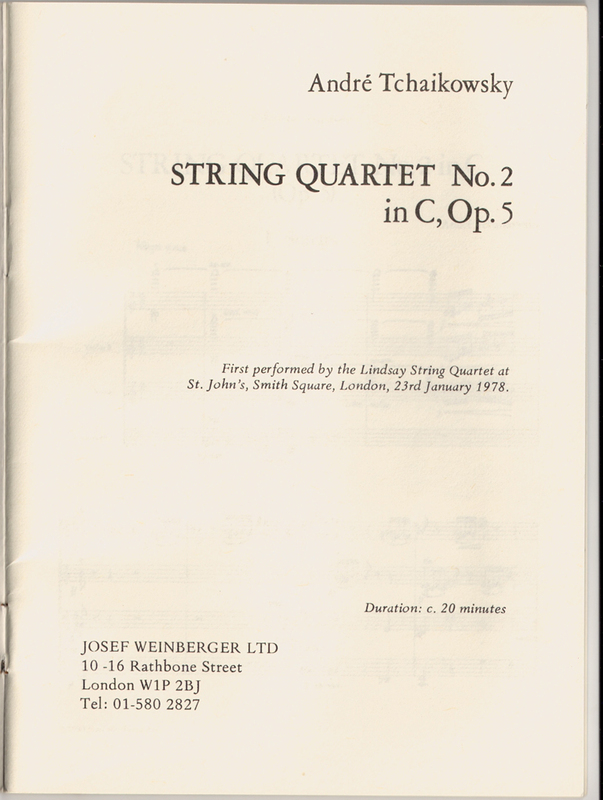 Its style, situated somewhere between the middle Bart6k quartets and Berg's Lyric Suite, sounds genuine; the writing for string quartet is certainly so, with none of the awkwardness or hesitancy one might expect of a pianist-composer. But I find it difficult to warm to second-hand histrionics. 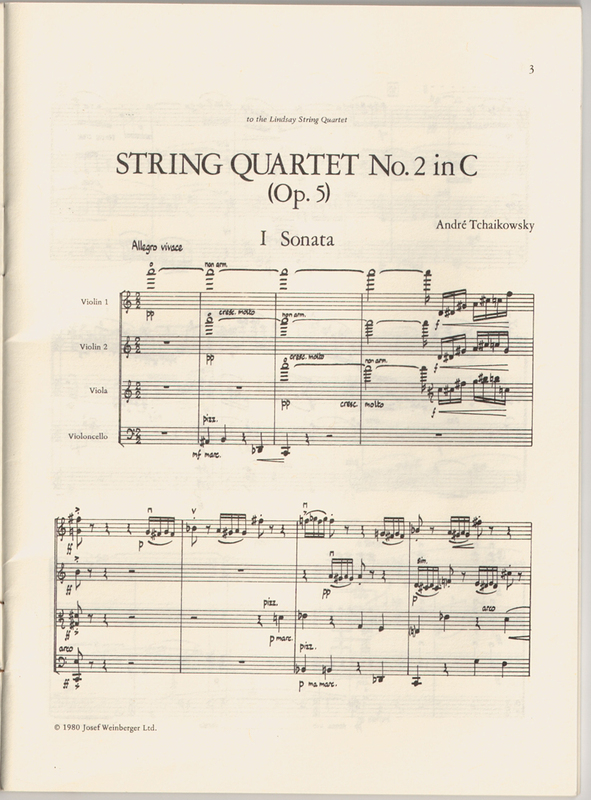 For those who, like myself, were as yet unacquainted with André Tchaikowsky as a composer, yesterday's premiere of his Second String Quartet made an agreeable impression. 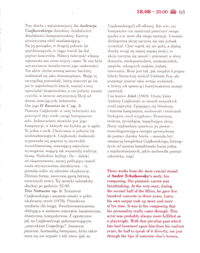 Here is a craftsmanlike composer able to turn old forms to individual advantage. 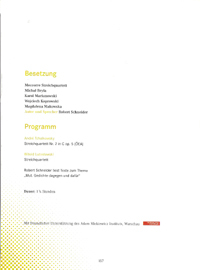 Born in Warsaw in 1935, Mr. Tchaikowsky has lived in this country since 1960, and has pursed an admired career as pianist. 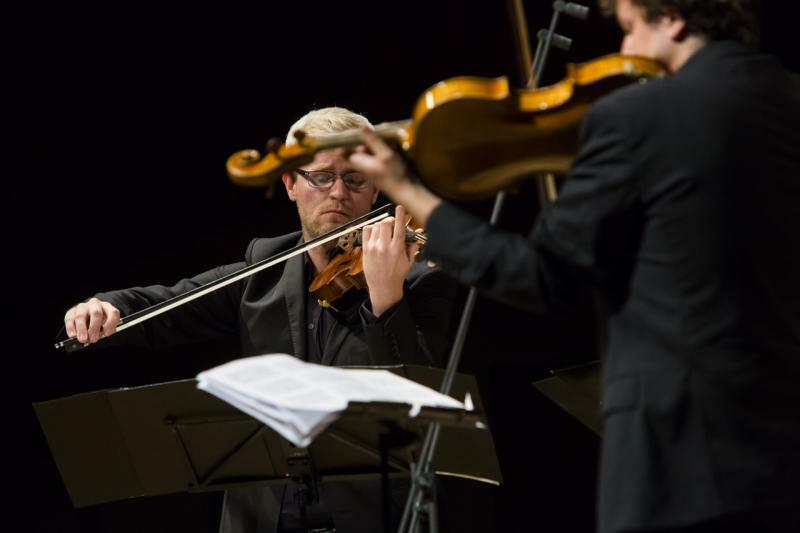 He is shortly to give a solo recital in this same BBC Monday lunch-time series which brought the Lindsay String Quartet to perform his new work. Their command of the music and their sympathy with it were evident, and Bernard Gregor-Smith's decisive 'cello solos were particularly eloquent. The three movements follow a traditional sequence -- forthright, contemplative, agitated. 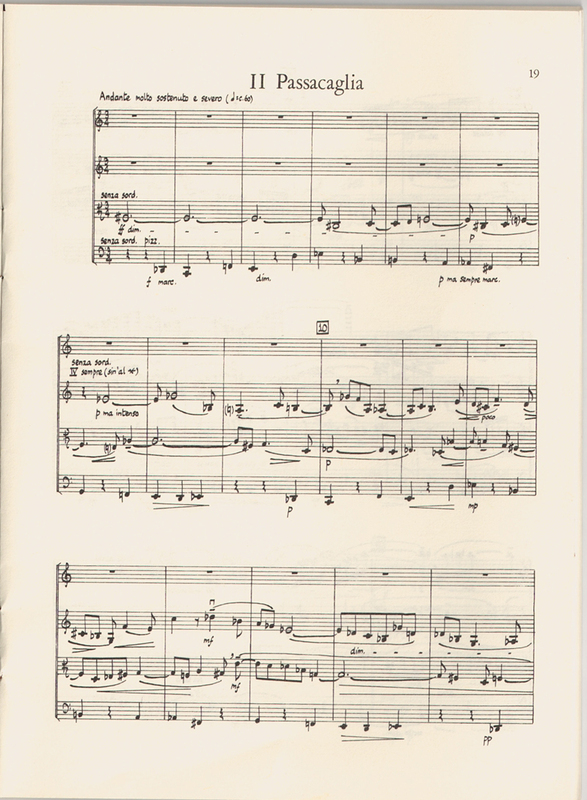 The middle one is a passacaglia (owing inspiration to Shostakovich's Sixth Quartet, the composer says) which manages considerable intensity and never lets the repeated bass pattern become tedious. 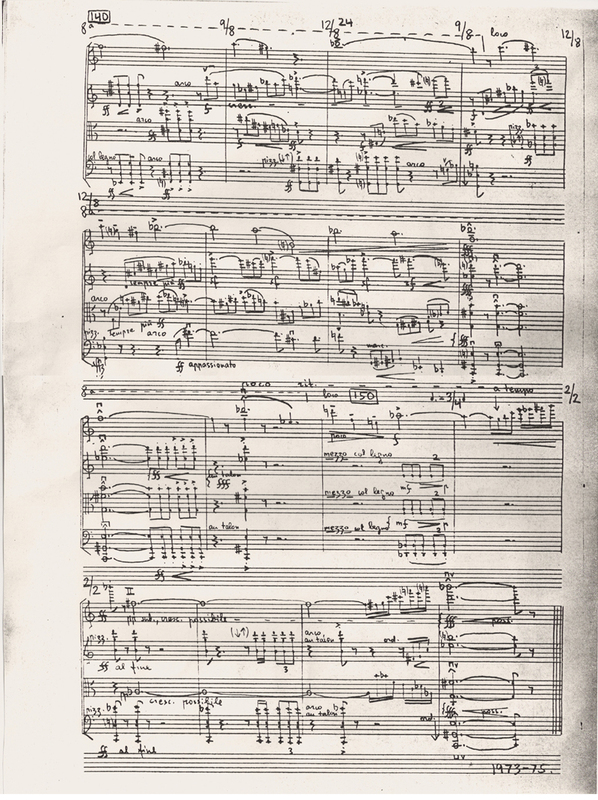 The first movement, thanks to strong internal contrasts, grips the ear immediately; the finale speaks in a more wayward and recondite fashion, but entices to further acquaintance. 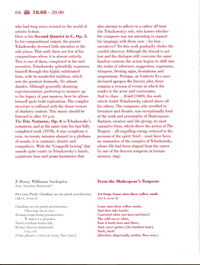 "We love André's quartets. 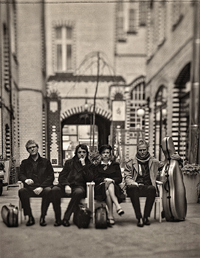 We love the music, especially the second quartet. It has some incredible textures and is very difficult music. 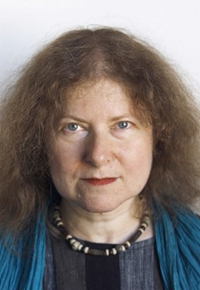 We would like to keep it in our repertoire, but it's not an easy prospect as it takes a lot of work." After only a few performances, the Lindsay had to put the work aside in favor other repertoire. 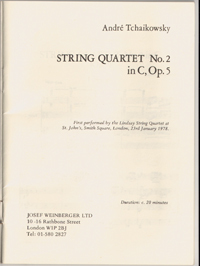 Weinberger Ltd. published the quartet in 1980. 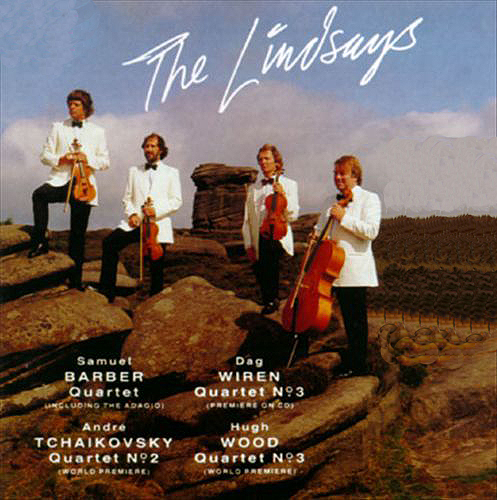 The Lindsay Quartet also plays String Quartet No.1 (1973-1975) - Opus 3.